Stained Glass Commission (2016): East Window at All Saints Church, Kesgrave, Suffolk. A very contemporary approach used by Rowland and Surinder Warboys, for the theme of St Francis of Assisi, in their design for the new stained glass window for All Saints Church, Kesgrave. 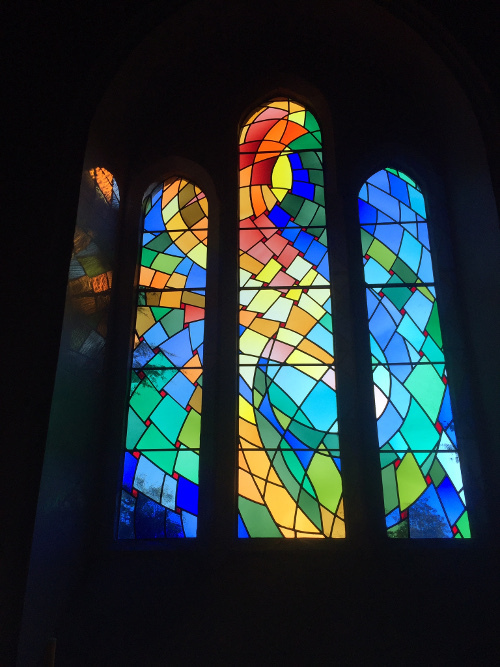 The window was commissioned by Michael and David Rayment in memory of their parents Barbara and Harold Rayment and has been installed in the 15th century chapel dedicated to St Francis of Assisi. The traditionally portrayed figure of St Francis in his rough brown tunic surrounded by birds, has been drafted into the 21st century, in this bold and beautiful, flowing abstract design. The woven design of the window picks up on St. Francis’ family background: his father was a wealthy textile merchant and Francis was freely giving all these textiles away in his commitment to leading a simpler life. In his exasperation at the rapid loss of family fortune, the father disinherited Francis. Rowland Warboys subtly weaves a present day response to the environment and the crisis nature is facing on all fronts. The symbolic use of the figure of eight path traced by noontime positions of the sun in the sky over the course of the year also brings to mind the dance of the honey bee. Simultaneously, making connections to a person, living as early as the 12th century, who also recognised the essential need for an eco friendly society. The completed watercolour design was translated into stained glass by Surinder Warboys, at Myglassroom, their studio in Mellis, Suffolk. Full scale cartoons were drawn, representing the lead and cut lines. Having travelled to Lamberts in Germany to personally select each sheet of hand made coloured glass, which varies in character from sheet to sheet. The glass was then cut, each piece being unique in shape and size and assembled using lead came.